Everyone needs a quick and easy side dish that adds in some extra veggies and whole grains. 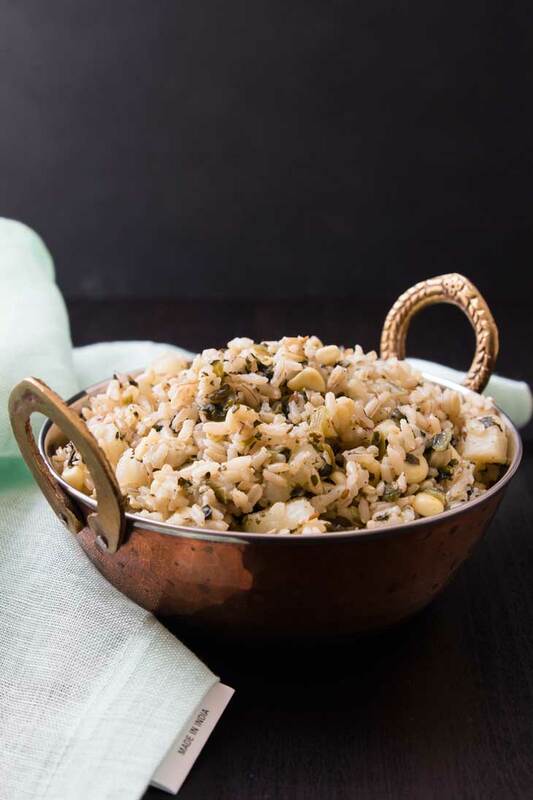 This Quick Indian Pulau Rice Recipe is made with brown rice, spinach, corn, potatoes, and peas! It makes the perfect side, or stand-alone dish for any occasion! When I’m making Indian food, I always try to have a well balanced meal consisting of some protein, veggies, and grains. And if any of you are familiar with Indian cooking, you know that any one meal does not consist of just one item. There’s always a vegetable, curry and/or daal, a few condiments, and some type of grain in the form of fresh roti, naan, or rice. But let’s face it…life is busy and you don’t always have time to make elaborate meals with multiple dishes and sides (which is almost everyday for me). So what’s my solution? 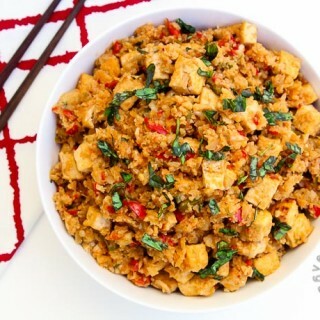 I make one main dish (such as my Cauliflower Tikka Masala, Curried Black Lentil Soup, or Tomato Sev Curry) and this awesome quick and easy pulau rice recipe! 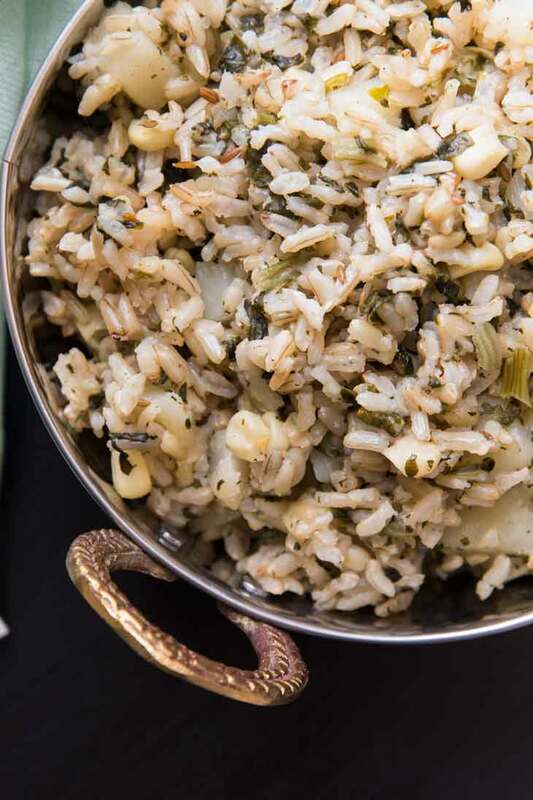 This pulau rice recipe is not only the perfect side dish for any Indian meal, but also a great anytime stand-alone dish for a light lunch or to take to a potluck! What is Pulau Rice? For those of you not familiar with Pulau or Indian cooking, it’s basically a traditional rice side dish and an essential part of the Indian meal. There are many different ingredient variations, cooking methods, and flavor profiles for this particular dish. What Makes This Pulau Rice Recipe My Favorite? Quick. Traditional Pulau rice recipes are made stove-top and can take up to 1-2 hours. This particular recipe is meant to be quick, yet tasty, and a great side dish to add some grains and veggies to your meal. So how did I take 1-2 hours of prep time and reduce it down to 10 minutes? Easy! The key to this recipe is to use a rice cooker. You can throw all the ingredients straight in with the un-cooked rice and let your rice cooker do the rest of the work. Another key is to use a few of my favorite frozen veggies to cut down on prep time. Although I prefer using fresh over frozen vegetables, my three frozen staples are corn, spinach, and peas. I always have tons of fresh baby spinach leaves in the fridge as well, but sometimes frozen spinach comes in handy. Flavorful. There are so many different types of Pulau with many different elements, but this particular quick rice recipe was not meant to have an overpowering flavor profile. It was meant to be subtle, but still delicious. The flavor of this Indian rice recipe comes from roasted cloves, cumin, and vegetables. Easy. Anyone, and I repeat anyone, can make this. In terms of prep, all you need to do is wash the un-cooked rice, dice the potato, and quickly roast the cloves and cumin on a stove-top. Then simply toss everything into the rice cooker and walk away. Loaded with Veggies. To be honest, we don’t do a lot of plain rice as a side in our house (I know…shocker since I’m Indian right??). The only way I’m making brown rice as a side dish with Indian food or potluck dish is in this recipe. I love it because it’s loaded with veggies. Potatoes, spinach, corn, and peas are my favorite combo when it comes to this pulau. My kids aren’t huge fans of peas (and to be honest, neither am I), so I only add them in when I’m taking it for a potluck since everyone else seems to love them. As a bonus, I’ve sent leftovers of this pulau rice recipe for school lunch the next day and my kids love it! So it’s a win-win for me because it makes school lunch easy and they get a healthy meal of grains and veggies! Healthy. It’s made with whole grains, loaded with veggies, and flavored with whole good-for-you spices. Pulau is a very common rice dish at Indian restaurants, but not always the healthiest unless made at home. One key to making Pulau is to ensure that the grains remain separate when cooked, and the best way to do this is with the addition of oil to the un-cooked grains prior to adding the water. The rice served at restaurants are often very oily because of this (and in fact, most places use ghee which is not vegan), but in reality you really do not need to add so much oil to get the proper rice taste and texture. 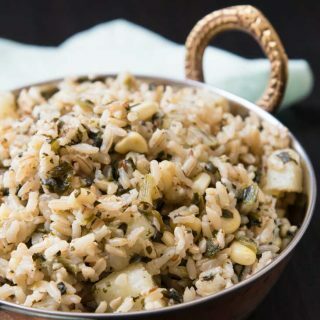 This Quick Indian Brown Rice Pulau Recipe with Spinach, Corn, & Potatoes has become a staple to go along with any curry or soup. It’s also the perfect side when you’re looking for a quick way to get in those whole grains and veggies. It’s very quick to make, requires only 10-minutes of prep, and a favorite at potlucks. 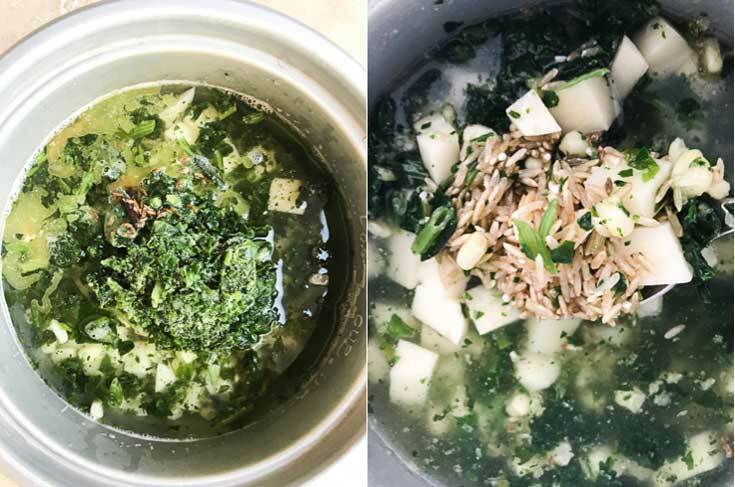 The easy rice recipe below is my basic and simple version, but you can easily add additional spices and/or veggies to change the flavor or spice things up! So if you’re looking for a healthy delicious side this holiday season, or looking for another quick weekday meal idea, try this pulau rice recipe and let me know what you think in the comments below! 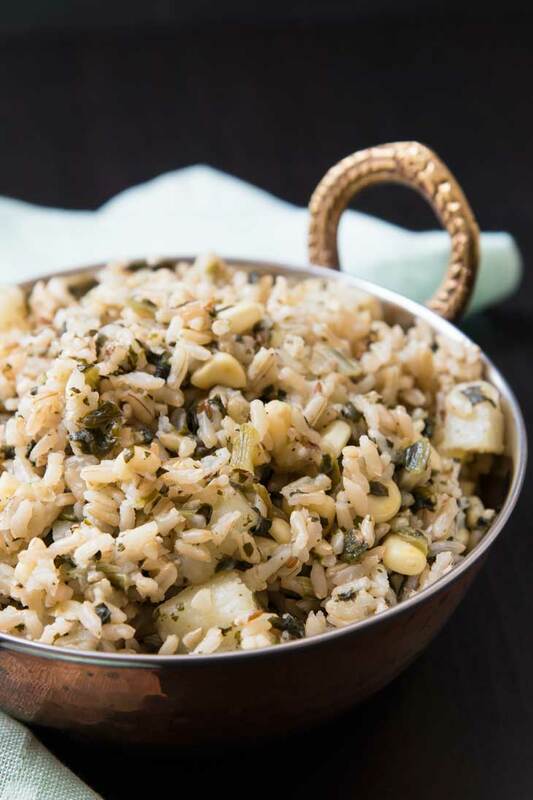 This Quick Indian Pulau Rice Recipe is made with brown rice, spinach, corn, potatoes, and peas! It makes the perfect side, or stand-alone dish for any occasion! Wash the brown rice in a rice cooker. Drain out the water as much as you can. In a small pot or frying vessel, add the cooking oil. When the oil is hot, add the cumin seeds and whole cloves and fry until fragrant (about 30 seconds). Add this (seeds, cloves, and oil) to the rice cooker while hot. Be sure not to burn yourself. Mix the oil with the uncooked rice. This will help keep the rice separated once cooked. Fill the rice cooker with the appropriate amount of water to cook 1 cup of rice. I usually add about 1/4-1/2 cup additional amount of water then the rice cooker calls for. Wash and peel the red potato. Dice into 1/2-inch small cubes. Add the potato pieces to the rice cooker containing rice and water. Add the frozen corn and frozen spinach straight in the rice cooker (without defrosting). (optional) Add a pinch of saffron and/or frozen peas into the rice cooker. Add salt to taste (do not add too much, you can always add more once the rice is done). Mix all the contents in the rice cooker well. Cover and turn it on. Once the rice is done according to the rice cooker, unplug and remove the vessel. Mix all the contents carefully. Note that most of the added veggies will probably be at the top of the rice so make sure you mix thoroughly. At this time, add some more salt to taste. Enjoy warm on the side or with your favorite curry! I'll have to add the corn and green beans next time! Love it and thanks! oooo...mushrooms! I must try to add that next time. I used to add butter as well, but kept this one with oil. But u can just as easily sub with any butter (even vegan butter!)! I saw your pictures of your vacation...so gorgeous! I definitely want to visit sometime! I love dishes that have it all! This one looks perfect, loving all of the delicious flavors! Thanks Sarah! It's my go-to when i need grains and veggies added into their meals! It's very basic and simple...not meant to overpower, but meant to enjoy on the side. It may be traditional to serve with an Indian meal but I think it would be a great Thanksgiving side. Most definitely! I've taken it to non-Indian potlucks all the time and everyone loves the flavors! I love that this recipe is low calorie and easy to make! 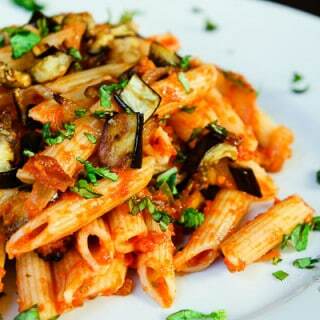 This is perfect for a quick, weeknight meal. Kids love it for leftovers the next day! Thanks for a lovely recipe! Any suggestions on how to cook this without a rice cooker? Yes!! Simply cook it stove-top like you would any other rice! Add in the veggies the same way and cover to cook rice as you would stove-top! This looks like a lovely dish and I like the simplicity of the ingredients! Thanks for sharing hun! What an interesting way to mix up rice! I love the sound of all of these flavors together. Yum yum! 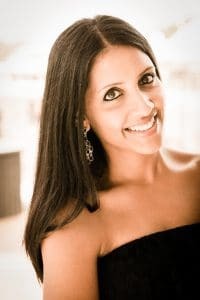 Anjali, this rice looks amazing! I'm going to try it in my Instant Pot since I don't have a rice cooker anymore. Yes! Would work so well in an instant pot. I so want one, but I have a pressure cooker I've been using for years and realized that an instant pot is basically an automatic pressure cooker, which sounds SO appealing haha! But made myself not get it (for now) ha! So rice cooker,and pressure cooker it is! This one looks perfect, loving all of the delicious flavors!